Running is getting more and more popular nowadays. However, some people don’t like running. Some just don’t have enough time, while others don’t have facilities which fit their sporting needs. This is quite a problem, since running helps you burn a lot of calories. Running is considered to be one of the most effective cardio workouts. 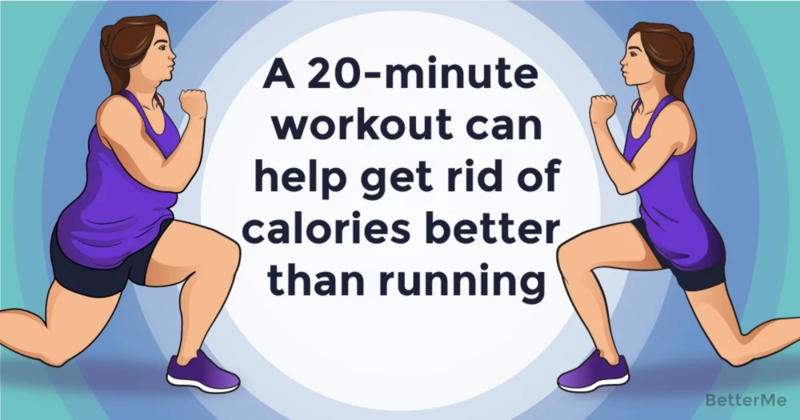 However, it is really time consuming, since your body starts increasing the speed of metabolic processes only after you run for at least 20 minutes. Top fitness trainers suggest that you jog or run for about 40 minutes. All women are doing their very best to keep fit and to look toned up, butnot everyone is ready to dedicate so much time to their workout session. Well, honestly, modern, busy ladies just can’t afford to spend so much time exercising on a daily basis. What should you do then? Luckily, you have BetterMe and today we have an option for you, which can substitute running in terms of calorie burning. You will be surprised, but static exercises sometimes involve more muscles than cardio. Consequently, they are more effective. Check out the list of exercises that will help you to stay fit and burn more calories than running. #3. Knee to Elbow Crunches.